Tarps Plus Blog: Need an inexpensive Truck Tarp? Need an inexpensive Truck Tarp? A lot of us know that truck tarps can get expensive but when you must have one you just have to have it. Here are Tarps Plus we make sure we can have that truck tarp for you at the lowest price possible because we understand the importance of quality products at a low price. These Truck Tarps are loaded with great features that make them quality long lasting products. 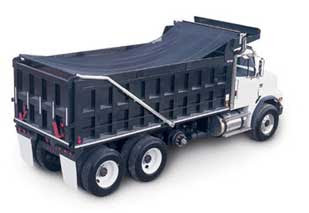 The Truck Tarp sections has many different kinds of truck tarps from dump to truck. Many sizes are also available for the truck tarps as well. The Truck tarps are water resistant, mildew resistant and have many other features. Take a look at the Truck Tarp section on www.TarpsPlus.com. Man I finally found an armless manual system for my dump truck. Everyone wanted me to buy a motorized system, but I knew there had to be an armless system out there. I needed high quality mesh to cover my load. I am picky about my mesh tarps so I called tarps plus and had them send me a sample. I was shocked at the high quality. My dump truck wont be a new tarp for years. Traps plus made starting my own trucking company so much easier. They constantly updated me with specials as well as new merchandise. I would recommend Tarps plus to anyone and everyone. My truck tarp is the best!!! At first i didn't think it was going to be strong, but I was wrong. I run a hauling company and really depend on truck tarps to secure my loads. After buying a truck tarp to sample I was hooked and replaced all of our truck tarps with quality tarps from Tarps Plus!! Our truck tarps have arrived. Haven't been able to find a Camouflage Tarp? Don't ever be Caught Without a Poly Tarp! !